Hailed as one of the world’s most beautiful train rides, the train from Kandy to Ella is top of most travellers’ lists when they travel to Sri Lanka. Not wanting to miss out on the adventure, we made our plans to get from Kandy to Ella by train. And it did not disappoint! But it was not all smooth going, getting tickets for the Kandy to Ella train was more complicated than we thought and managing to sit down to enjoy the views was a mixture of luck and being prepared with our Kandy to Ella train hacks! If you're looking for more Sri Lanka inspiration read our full Sri Lanka itinerary. We didn’t book any tickets before we arrived in Sri Lanka and in peak season (January) the train to Ella was booked out weeks in advance. But through a bit of research and good timing, we secured four seats to enjoy the stunning views and relax on the picturesque seven-hour trip. If you're travelling from Kandy to Ella train is the best way to get there. Read on for all the details of how to book Sri Lankan train tickets in advance or give yourself the best chance of getting an unreserved seat on the Kandy to Ella train. Tickets for the Kandy to Ella train go on sale 30 days in advance and are usually snapped up by travel agents and tour companies who grossly inflate the prices. It’s possible to purchase these before you go on your trip through online vendors. Expo Rail was popular but has recently shut down. *Update* You can now book tickets online at 12GO Asia. Prices are more than you’ll pay it the station but worth it to have tickets secured if you know have set travel dates. 12Go Asia now have their own V.I.P cabin which you can book instantly and saves any hassle with not getting tickets. It runs every Thursday and is a great option if you want a little luxury. Once you’re in Sri Lanka you can purchase tickets from a tour agency, bear in mind that you will pay a hugely inflated price and many reserved tickets are for the first class sections which are air-conditioned with no open windows to hang out of and snap amazing photos. The best option is the observation car which looks amazing with panoramic windows and some that open for photography. However, this train arrives when it’s dark, meaning you miss the last part of the views and the carriage travels backwards. If you can reserve a 2nd or 3rd class seat on one of the earlier trains you’ll be treated to the best views and the seats are fine for the day time journey. So you weren’t as prepared as some people or didn’t want to pay the extra money to reserve? Don’t worry! You can still get a seat and enjoy this spectacular journey in the second class unreserved cabin. All by following this one top tip: DON’T get on the train in Kandy! Get a tuk-tuk 10 minutes out of Kandy to Perideniya Station. All the trains that go to Kandy stop here twice, once coming from Colombo and then on their way back out towards Ella. If you get on the train at Perideniya before it gets to Kandy, many people will get off and you’ll already be in the carriage giving you first dibs on any available seats before the throngs of tourists get on. When we did this the entire carriage emptied at Kandy and we secured 4 seats next to each other. There is also one train that only stops at Perideniya and doesn’t go into Kandy. As a result, this train is much quieter than the others and you have a better chance of getting a seat. -Arrive 15 minutes early to buy your tickets. - Ask a member of staff where the unreserved carriages will stop (show them your ticket and they will direct you). - Don’t worry if the train is full when you get on, most people will get off in Kandy. There is also a train that leaves Kandy at 3.30am if you need to be in Ella earlier. For up to date train timings check on The Man in Seat 61. 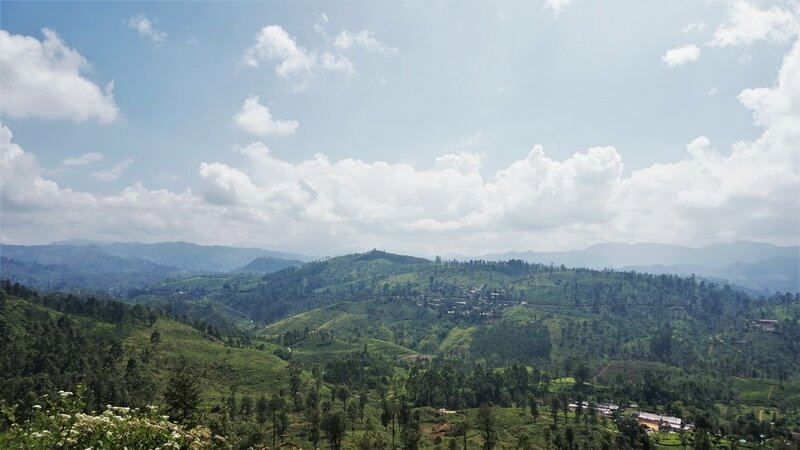 - We had four seats spread across the train and think that the views were best on the right hand side up to Nanuoya (Nuwara Eliya) and then the left heading into Ella but you’ll have great views no matter where you sit. - The train journey takes 7 hours so some people break it up by staying in Nuwara Eliya or Hatton to climb Adam’s Peak. If you're getting off early read this article on things to do in Nuwara Eliya. - Take some drinks and snacks with you but there are also a constant stream of vendors walking through the carriages with nuts, fruit and a whole range of fried delicacies. Bring small change! - In second class, the windows and doors are open the whole way which is great for photos (and cooling). Get your doorway photos in the first half of the trip as the train gets very crowded from Nanuoya on making it difficult to get to the doorway. - Ella is often cloudy and depending on the season there can also be rain. It bucketed down for the last half an hour of our journey and we were there in January. So make sure to enjoy the parts when the sun is shining! - There are overhead racks for backpacks and smaller bags but if you have a big case you may need to store it behind the last row of seats or in the entrance way. The train journey from Kandy to Ella is really beautiful and a great way to travel between these two places. But if we hadn’t had seats it would have been a long, hot and tiring journey which would have taken away a lot of the enjoyment. So make sure you do everything you can to get a seat and take in the incredible views. We stayed in Kandy twice, once on a backpackers budget and had a brilliant stay at Kandy Backpackers Hostel in a double room. They have a pool, free breakfast and often have gatherings on the rooftop with home cooked dinner. Check out prices here. With my parents we stayed in the beautiful Cottage 99. Amazing hosts and one of the best breakfasts I've ever had. They even packed us goodies to take on the train to Ella. Check prices for Cottage 99. In Ella we stayed at Namal's Great View Guesthouse. After a mix up with the booking we ended up having a great stay and it really did have a great view and some swing chairs to enjoy it from. Check out some pictures and information here.